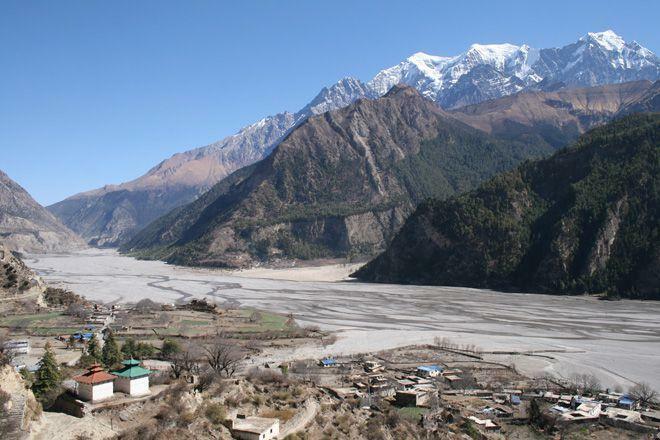 Why is the Annapurna Circuit so beloved by the many trekkers that take up the challenge? It could be the landscape, the cultures, the lifestyle – or all of this and more: the Annapurna experience. Here are five of the things that make the route so special. The Annapurna Circuit is well known for its teahouses, where you can settle in for a good meal and night of comfortable rest before returning to the mountain passes. The memory of great teahouses with spectacular views and warm hospitality is something many trekkers treasure on return. Staying at teahouses, you will be well-fed, often with a fair amount of choice, including traditional Nepali dishes. One of the delights of travelling the Annapurna Circuit is the abundance of fresh local produce grown at lower elevations– the apples are a must-try, and wonderfully refreshing after a trek. Hot springs make for a memorable excursion, and a chance to soak off the dust and relax aching muscles. Our treks take in hot springs where possible and are another great unique feature of the mountains. Despite its rugged terrain and high altitudes, the Annapurna range is full of life and civilisation. You are likely to come across several ethnic groups on the Annapurna Circuit, encountering their customs and passing their places of worship – it can be greatly rewarding to pay attention and learn what you can. Striking up a good rapport with your guides can also offer a wealth of information, helpful advice and fascinating stories about the landscape, its people and its secrets. There are many breathtaking sights along the way, with spectacular peaks including Machhapuchare and Annapurna South, and there’s nothing like seeing them bathed in the glory of sunrise – getting up early in the morning might feel tough, but you can be guaranteed it’s worth it!